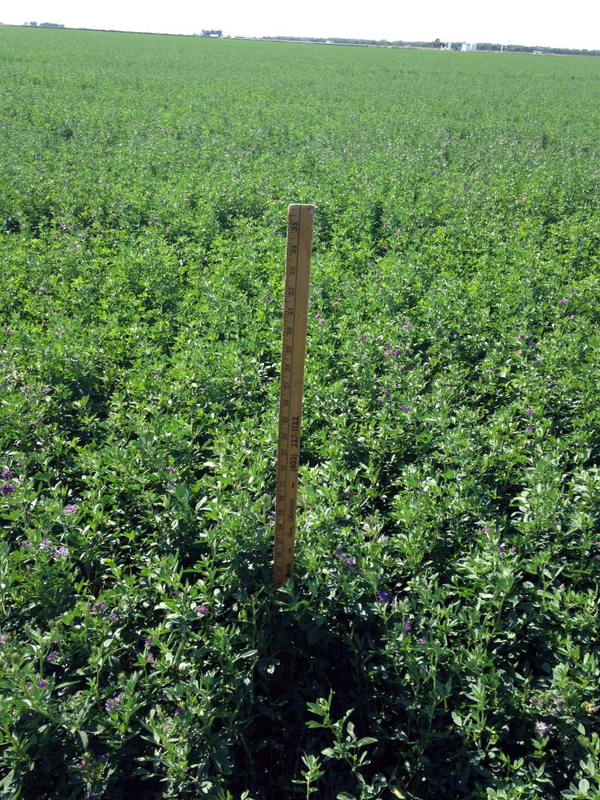 Supercharge Your Dryland Alfalfa With Eden Solutions! 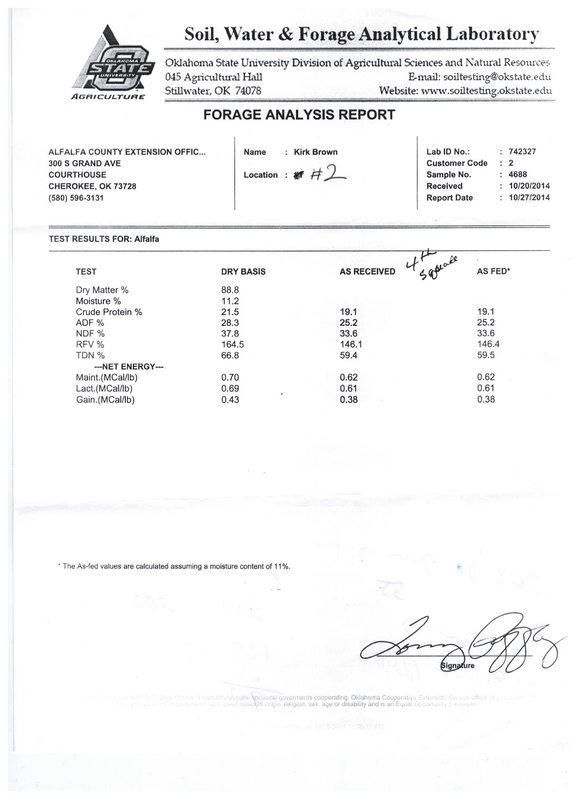 Blue Gold™ Results On Cid’s Organic Blueberry Farm In Minnesota! 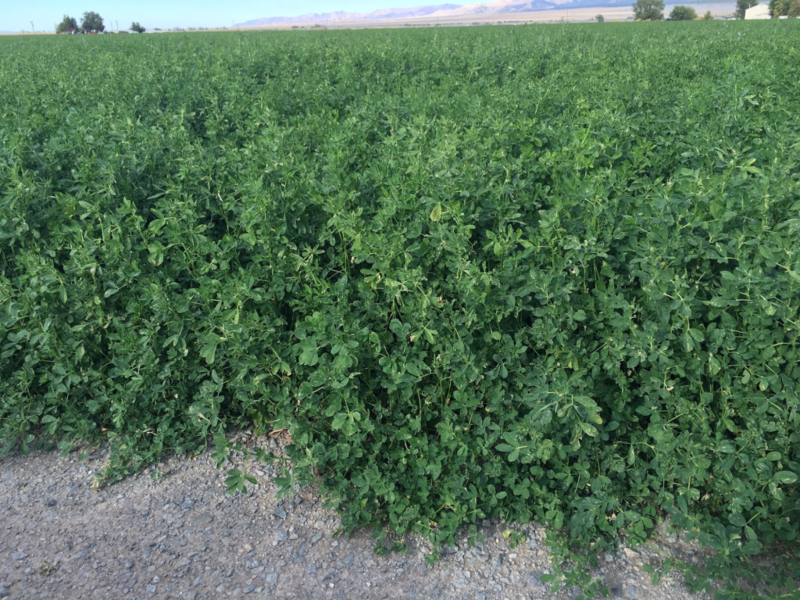 Blue Gold™ Solutions grew Alfalfa with an RFV of 227.2% and Crude Protein of 26.3% on the 5th cutting, reversed yellowing & Hollow Stem Syndrome, grew very thick hay over 2’ tall, and produced 5+ tons per acre on a newly established dryland field in a drought! Alfalfa is a nutrient gathering machine with its ultra-deep roots. But most people do not know that most of the nutrition is gathered from the atmosphere. The biggest mistake farmers make with Alfalfa is trying to feed it too much Potassium. If you look at the stem of Alfalfa and see little black dots, this is a pure sign of Potassium Nitrate excess in the plant sap coming from the soil. Alfalfa is one crop that gets most all its Potassium from the air. This Potassium overload will set back the growth and will push the Calcium availability out of the plant. High Potassium will push available Calcium around. High Potassium soils will cause high Nitrate in the cellulose, which in turn creates nitrocellulose or gunpowder Alfalfa because the available Calcium was pushed out. Recommendations of 0-0-60 produce catastrophic conditions and pest control budgets of $100+ per acre. The understanding of forage fertility is fundamentally appalling in the modern Ag arena. Nutrition cures any and every condition in any crop when adequately balanced. Also problematic is high Magnesium. High Magnesium pushes out Nitrogen pound for pound and causes a shutdown in Alfalfa from high/higher Magnesium which escalates the problems with Potassium, Phosphate, and Calcium. A good Magnesium ration is seven parts Calcium and two parts Magnesium. To grow abundant Alfalfa requires two critical elements in proper ratios; these two elements will open the doors for all the other elements to flood in. Available Phosphate at 750 pounds per acre and available Calcium at 3,000 pounds per acre. Without these two vital available elements, in proper ratios, growing becomes troublesome. High Potassium soils with little Phosphate and pushed out Calcium creates a problematic situation whereby the insufficiency to catalyze the appropriate formation of protein and other metabolites. 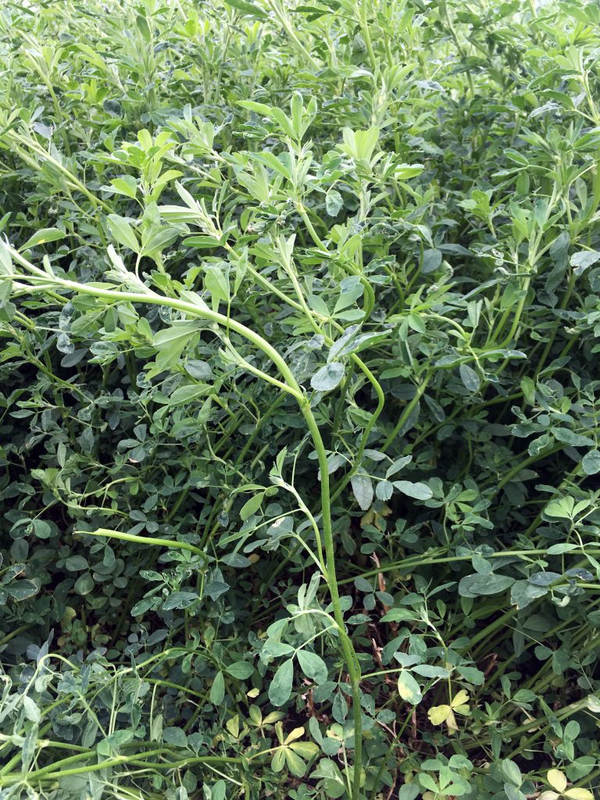 Phosphate is a cold tolerant mineral that is not available in mass until the soil warms up, but it is the first mineral that the Alfalfa is looking for very early. That’s why Fall elemental application and foliar are so important. As the crop sleeps for the Winter, it messages the minerals for availability. It is looking for Phosphate first, Nitrogen second, and very little Potassium third. So, Potassium is a distant third at 500% less than other significant elements. Foliar nutrient applications that work are the best available asset the farmer has in a poor or out of balance soil condition that is being rebuilt. We do not have the time to wait for years for the soil to balance so we foliar our way to production success as we are rebuilding. Pest always attacks the first cuttings mostly because the phosphate is not available in colder temperatures, so the plant BRIXX levels are low along with high salt soils that drive up the plant sap pH above 6.4 and ring the dinner bell for the pest. 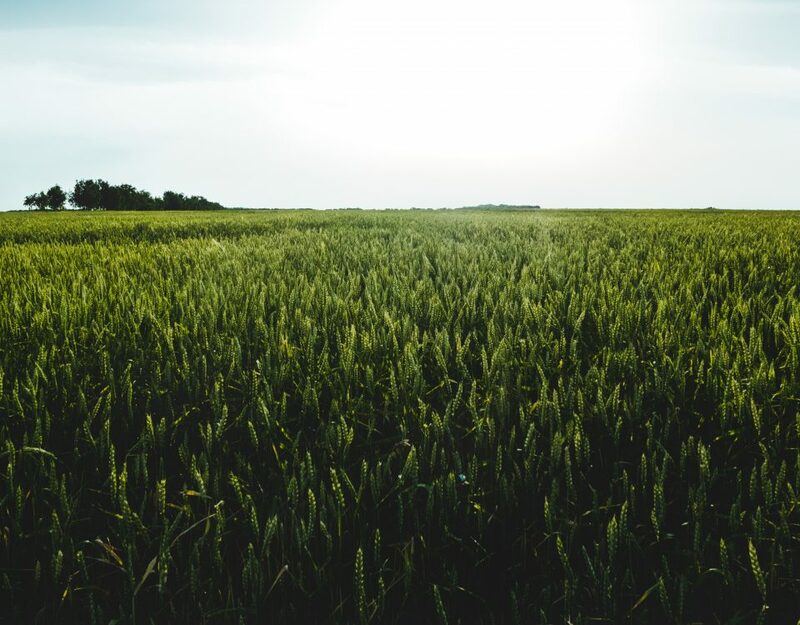 Early foliar applications that are plant available with phosphate and micronutrients can now utilize the pest budget towards nutrition where it belongs. Pest attack unhealthy plants period; and nutrition reverses the attacks when the plant sap is balanced at 6.4 resistance (pH). Alfalfa with Hollow Stem Syndrome shows a Phosphate of Boron deficiency. As Phosphate of Boron is the activator of Calcium. Calcium will not move into the plant without Phosphate and the Boron activator. 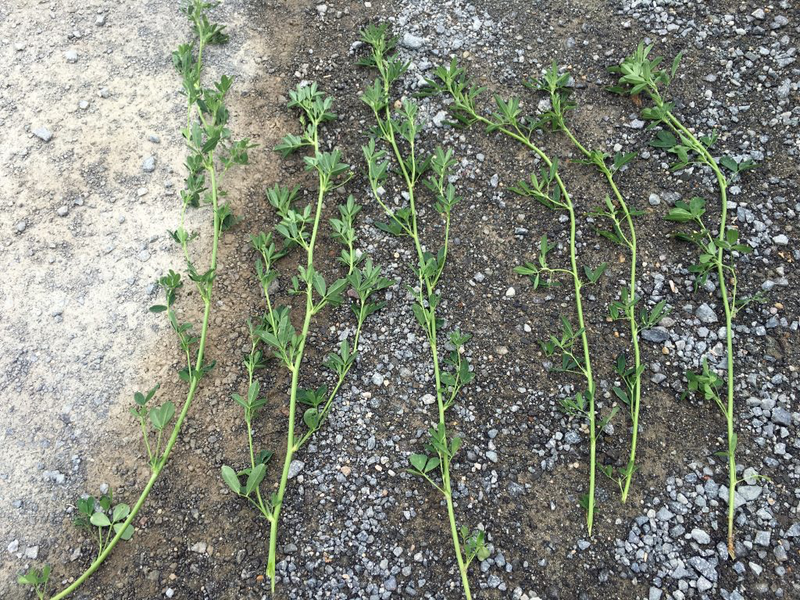 Hollow Stem Syndrome is just a lack of proper nutrition and a proper Boron level. It is like rickets to humans. Just a deficiency. Never use a chelated solution in western Alfalfa because of the high Calcium ratios. 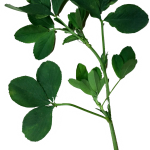 The Alfalfa will lose its leaves because the chelate thins the protoplasm that holds the leaves to the stalk. So chelates on a high carbonate soil is a no-no; it will shed the leaves, especially during harvest. This is where the Phosphate is so essential in Western soils. You must have that Phos-Calcium ratio intact if you will begin to grow high yield Alfalfa in any soils. 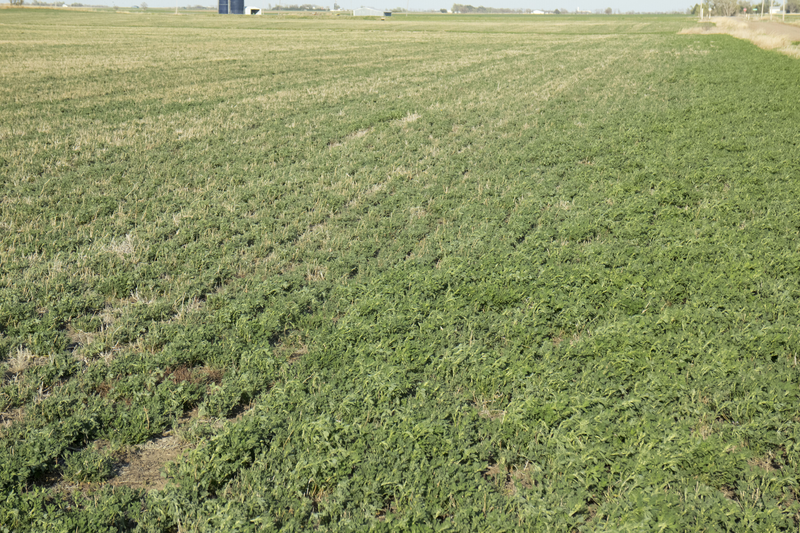 The real potential for Alfalfa when all nutrients are dialed in 100% is 20 tons per acre at 28% moisture with a six to six and half month growing season. We have always been taught to cut the Alfalfa pre-bloom because the protein is the highest and this is correct. What has been failed to understand and explain is that the high protein content at pre-bloom in mostly un-digestible protein. This is why ‘any’ animal will not touch Alfalfa till it blooms about 20% when they have plenty of other forage to eat. Because the animal knows the post-bloom Alfalfa carries a lower protein content, but the digestible protein is the highest at this phase of the plant production. The plant release co-enzymes at the start of bloom as this is what increases the digestibility of the hay. 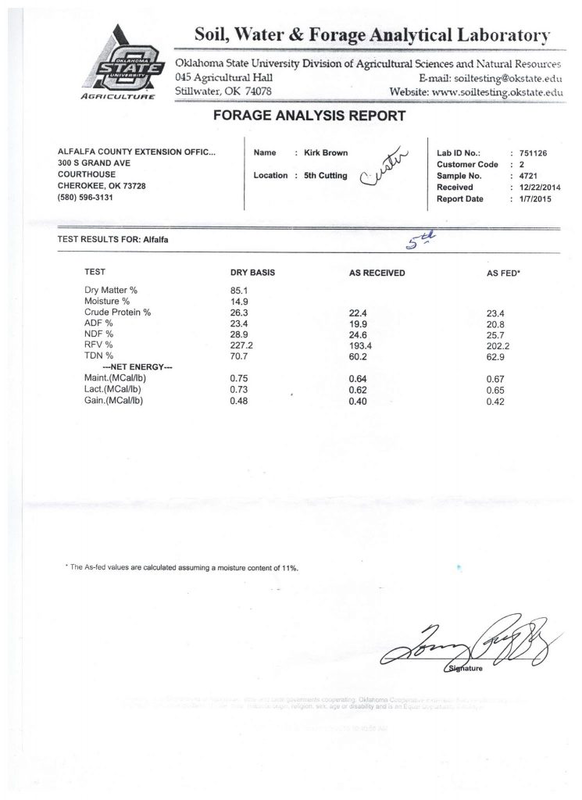 This is why dairy cows eat way more than they should of Alfalfa because of the lower pre-bloom digestibility. Animals will consume a third less post-bloom Alfalfa with a high nutrient and lower protein content. Watch the animals, and they will tell you whenever they are given a choice of forages to eat in front of them and will go after post-bloom Alfalfa whenever the RFV is right with the nutrients. 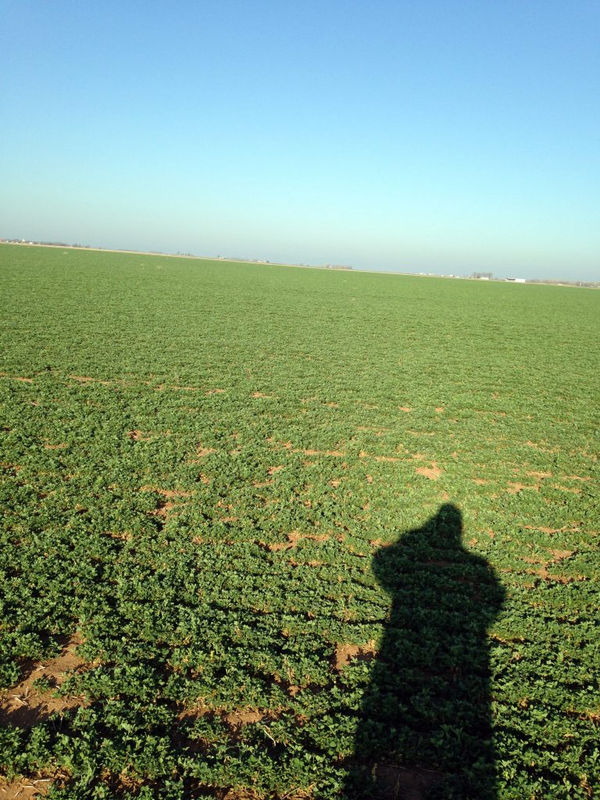 Dry Land Alfalfa grown in Alva, Oklahoma by Farmer, Kirk Brown. 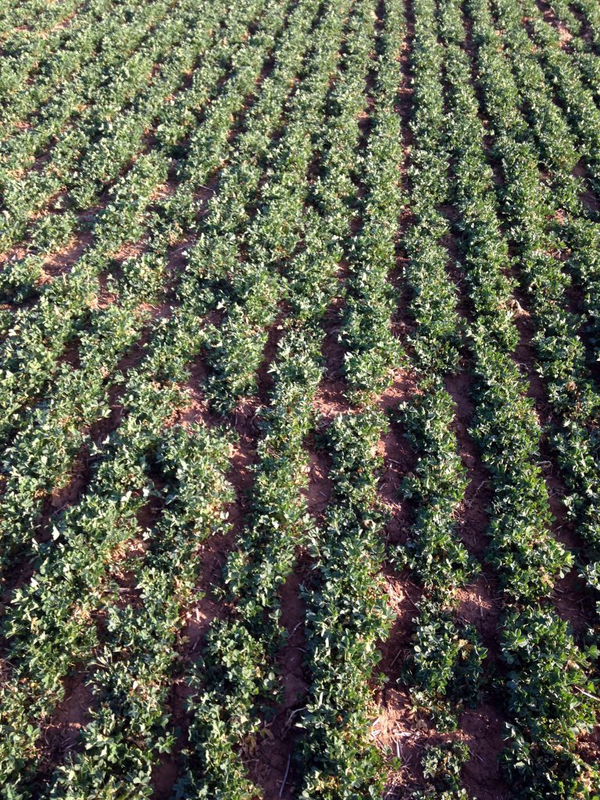 Blue Gold™ Solutions produced 5 cuttings in Oklahoma in the middle of a drought on dryland Alfalfa. Through the decade, industries have risen on the pedestal of technology, advancing and maximizing capabilities and availabilities. Today the agricultural sector has been operating under a technology developed only 60 years ago. However, due to environmental and entropic side effects, recent reports on maximizing harvest quality and quantity have been dismal in fact. 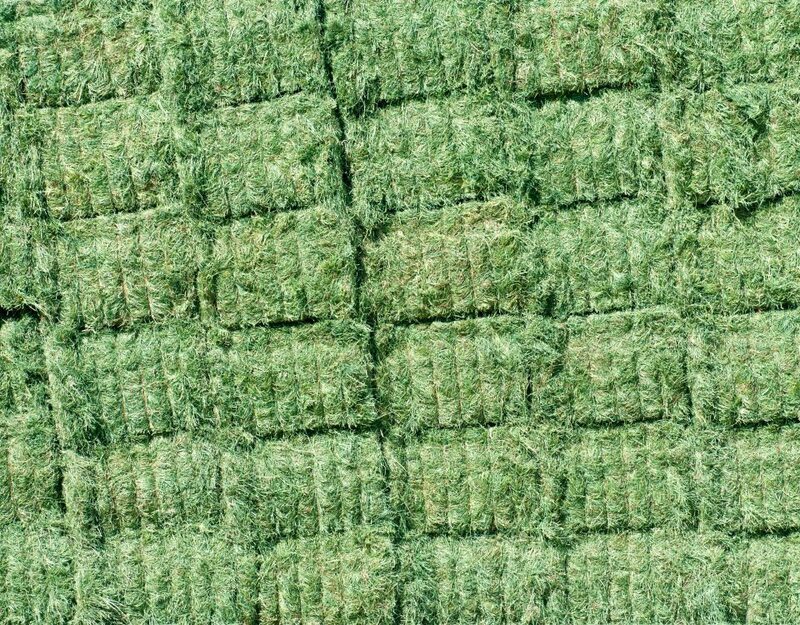 Farmers in Oklahoma and Texas may reap only one Alfalfa crop and one Bermuda Grass crop this year. 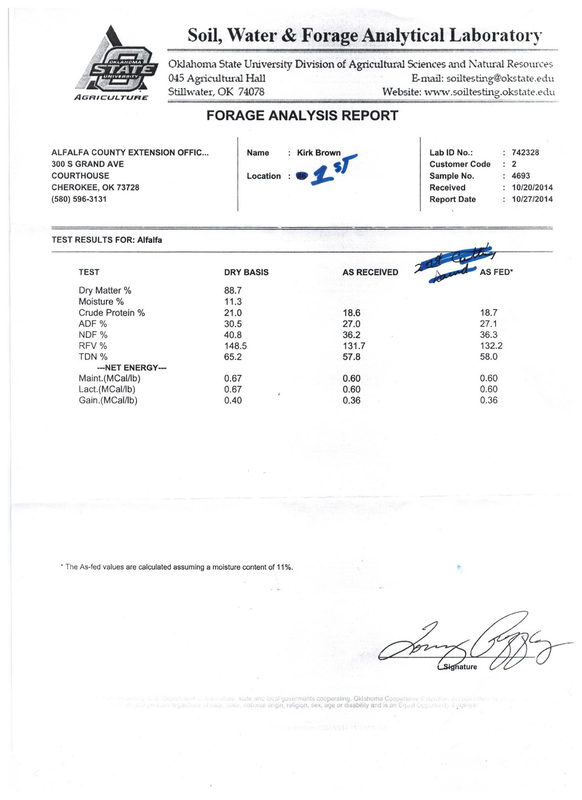 Compare this to the normal of three according to Larry Redmon, a forage specialist at Texas A&M University. He commented last year about the continuing plaguing drought. Each year requires more fertilizer and more pesticides only to produce marginal results compared to the previous year harvest. We researched and developed Blue Gold™ to set the Agricultural industry back on track. Using this new technology, one Alfalfa farmer, Kirk Brown in Alva, Oklahoma, has seen some unprecedented results. His dryland Alfalfa field has undergone the 5-year drought condition like everyone else, and yet instead of the traditional 1-2 ton per acre on dryland Alfalfa established fields, he has received the benefit of 5+ tons per acre on a newly established dryland Alfalfa field. Kirk has seen more than just increased quantitative earnings. He has seen a quality of his crop unlike ever before In fact, Oklahoma State University, after completing their tests of the harvest, agreed that his harvest held a quality seldom seen in the industry. The OSU tests show unbelievable results. 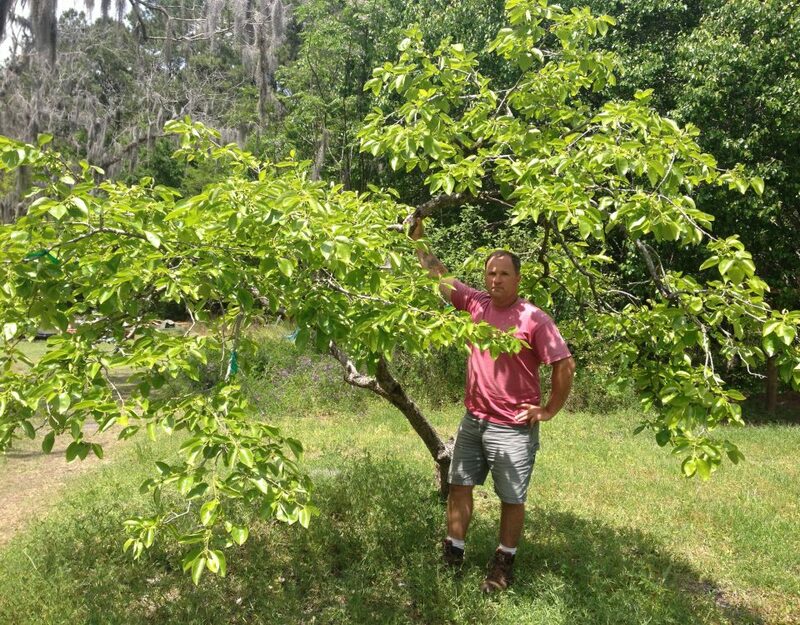 Kirk used zero pesticides or herbicides during the growth of this amazing quality crop while using Blue Gold™ Solutions! Blue Gold™ was designed to jam as many nutrients into the plant as possible. We know the average soil is mostly biologically and nutritionally dead from experience. Many soils are so abused with tillage of topsoil loss and the chemical onslaught. All life begins with the soil. Soil is a living organism that needs care all year long. Eden’s Blue Gold™ Solutions are impressively effective through foliar and soil feeding at inducing the plant to pull up nutrients from the soil through the roots via electrical stimulation. Simply, it makes soil nutrients rush into the plants via the roots. It mines the soil of nutrients very efficiently which is an excellent thing as long as we are good stewards by replenishing nutrients to the soil. because the soil was mined in a short time of nutrients. This means the soil is beaten up and needs mineral input so you can get those amazing results including NO pest or disease as well as increased yields continuously. We see and receive ourselves, 100% of the time when the soil is tuned up. Plant sap analysis testing along with plant sap resistance (pH) monitoring tells us precisely what is available or lacking in the plant instantly upon testing. A plant sap resistance (pH) below 6.4 will lock out calcium, magnesium, potassium and available salts. Resistance above 6.4 locks out, phosphate, sulfur, silica and all micronutrients. 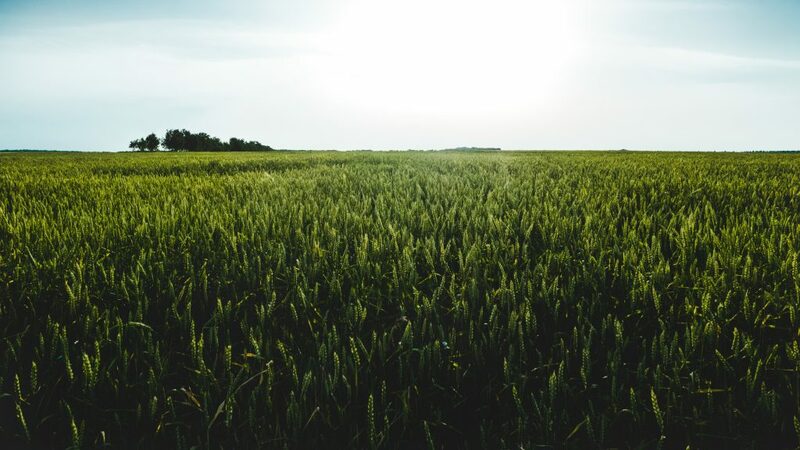 The farther away the plant sap resistance slides away from 6.4, the greater the lockout of these nutrients and pest and disease pressures rush into the plant. 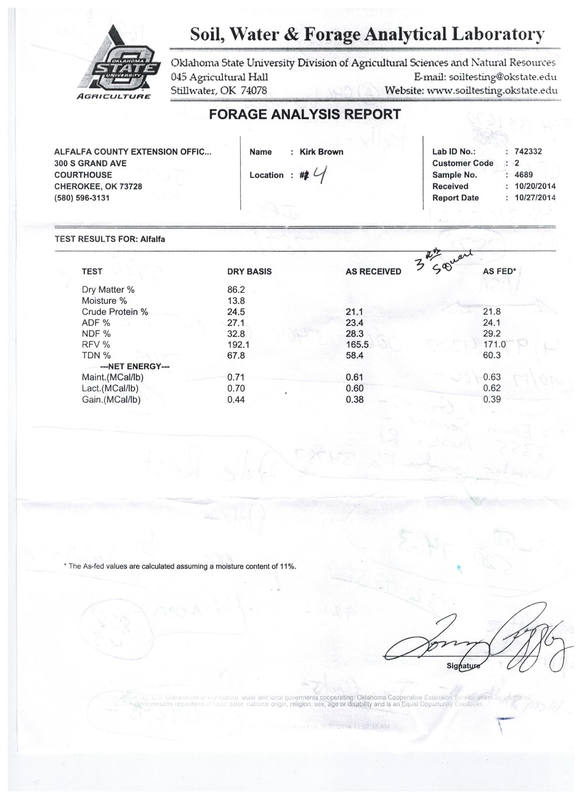 This is why a working foliar program is so essential to high production; you get your results back in 24 hrs. and correct the plant within 48 hrs to increase production all the while. 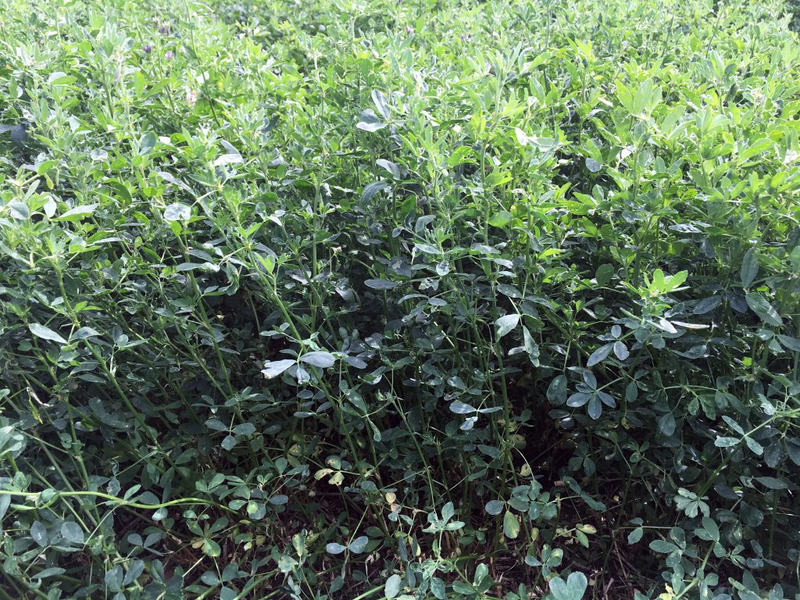 Pesticide and Herbicide and Fungicide Free Alfalfa grown on the Blue Gold™ program. Increase Nutrient Density, RFV, TDN, Protein, Growth, And Cuttings! From 1-2 To 5 Tons PER ACRE! This is dryland Alfalfa in Cherokee, Oklahoma. The field usually produces 1-2 cuttings per year. This picture shows his 4th cutting while using Blue Gold™ Alfalfa Blend with enough time for a 5th cutting! In his best year, the farmer told us he usually gets 1-2 tons per acre, and this year his Blue Gold™ Alfalfa is approaching 5 tons per acre! All of this during an ongoing drought condition. 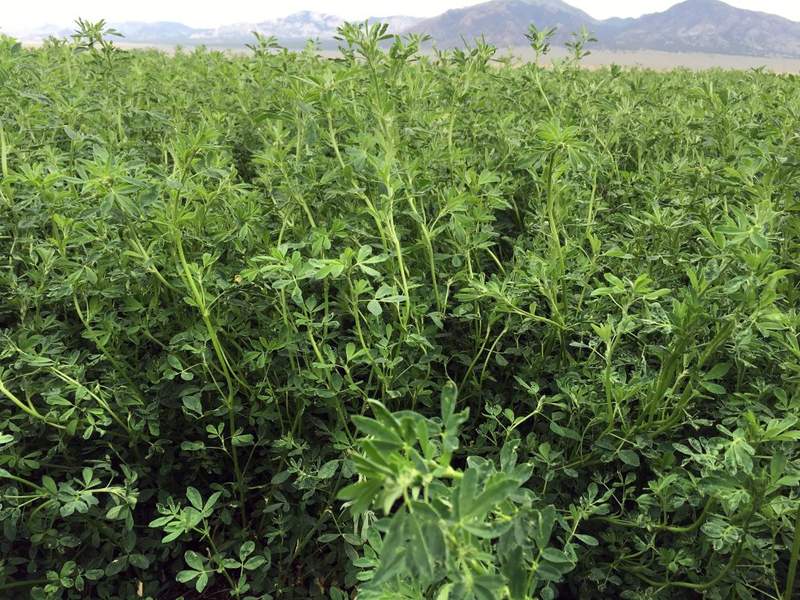 James Farm In Utah Had A 50% Larger Yield On The 4th Cropping Of Alfalfa! This plot of conventional Alfalfa was planted on the worst soil and under the worst pivot on the farm. The owner was so shocked and pleased to get such dense growth and such a high increase in yield. 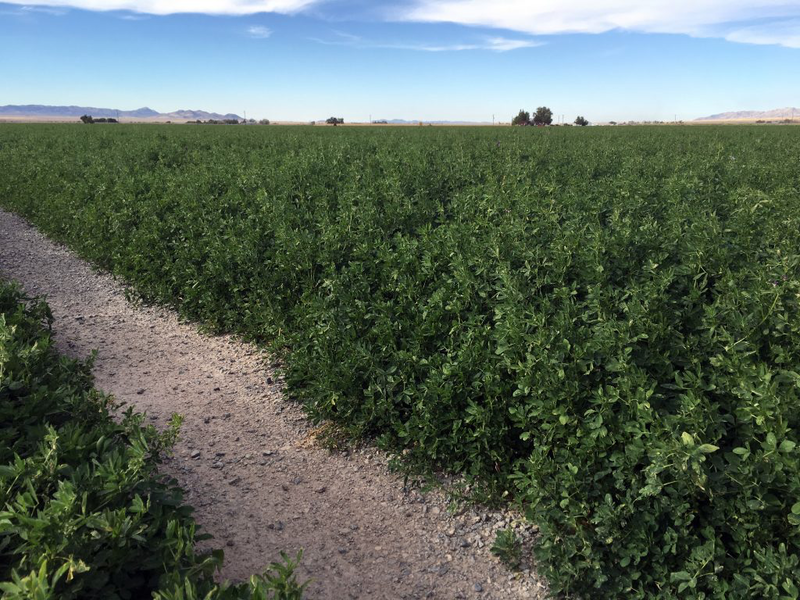 This is irrigated roundup ready Alfalfa (lower yields) in Utah on the Blue Gold™ Program! 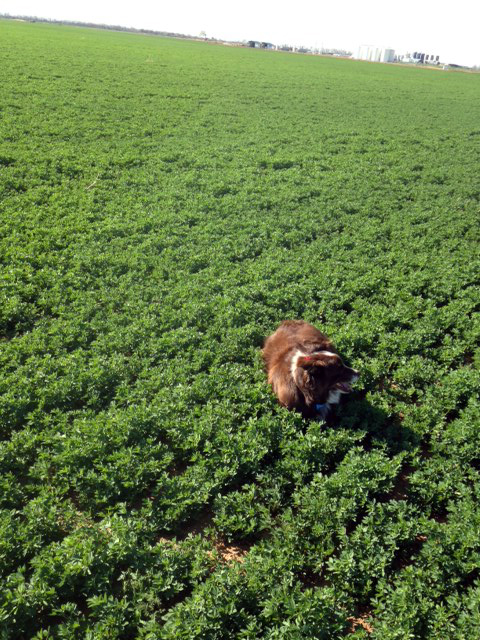 This photo is of Alfalfa in Utah on James Farm. Usually, this hay produces 1 stalk with no lateral branching. As you can see, they are very pleased with the additional lateral branching and leaf sets of the Alfalfa stalks they usually do not get. They are excited with the quantity and quality of the BlueGold hay. This hay is over 2′ tall! Also, their hay always has had Hollow Stem Syndrome; since the BlueGold applications the stems are all closing up. This is a sign of nutritional value and heavier crop yields over previous yields! This hay is over 2′ tall! 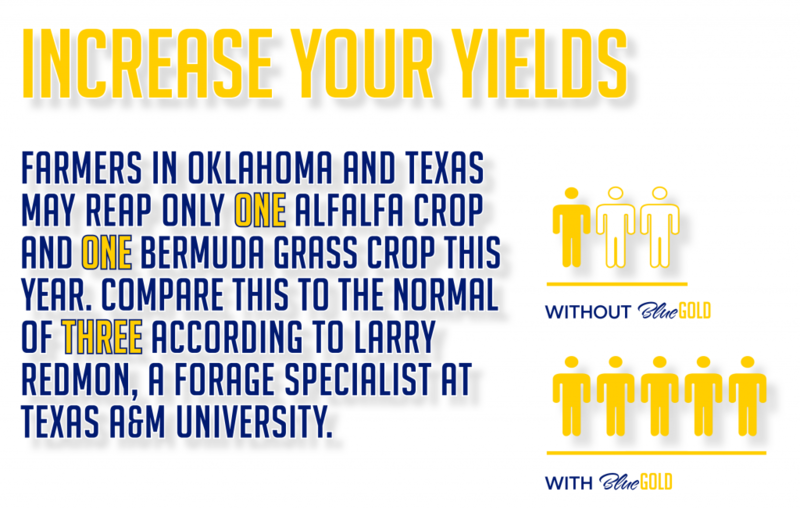 The nonyielding GMO Alfalfa produces and yields more after being treated with Blue Gold™ Alfalfa Blend. The internode spacing you see in the photos (above and below) is far from standard with GMO Alfalfa, but it is on the Blue Gold™ Program. This produces more tons per acre. 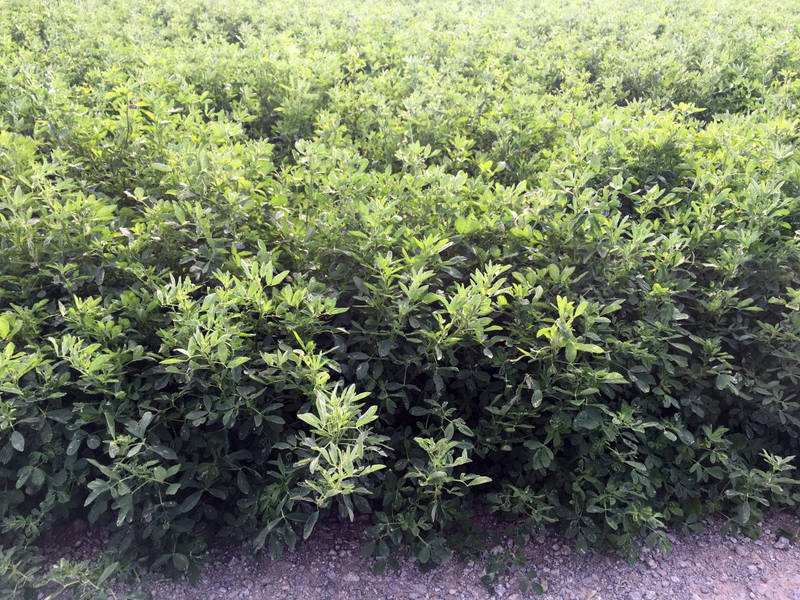 Alfalfa lower leaf production is THICK on the Blue Gold™ Program. GMO Alfalfa (like below) has tendencies to turn yellow in growth. This comes from high plant sap resistance (pH) that locks out Calcium, Magnesium, Potassium, and available salts. This GMO Alfalfa had severe yellowing, before being treated with Blue Gold™ Alfalfa Blend (see the after picture below). The farmer said his GMO Alfalfa has never produced like this and is ecstatic that he is getting such dense tall growth. Every Year Farms And Growers Are Having To Use More Fertilizer, Pesticide, Fungicide, And Herbicide Inputs With Diminishing Results. Every Year Is A Decrease In Yields And Harvest. Blue Gold™ Solutions, Help You Detach From This Vicious Race To The Bottom Declining Cycle And Achieve Amazing Results! Sustainable soil will absorb well, and it will warm up quickly in the Spring. It will not crust after tillage or planting. Your soil will soak up heavy rains and have no standing water, with little to no runoff. It will store moisture for drought periods by absorbing up to 3″ of rain in 20 minutes and have an abundance of bacteria and other microbial life. It will be a suitable environment to support very high populations of soil organisms. Your soil will resist erosion and nutrient loss from runoff and will not require the increase of fertilizer inputs for plant life. It has a rich earthy smell and produces healthy plants with high BRIXX that are disease and pest resistant. Most sustainable soil farmers produce high production crops with zero NPK inputs. Today, as a modern company Eden Solutions still believes in old-fashioned customer service. We are a family-owned business with revolutionary products that save fields and operations. We are results driven, and we treat you exactly the way we would like to be treated. Our time is yours. Please contact us. 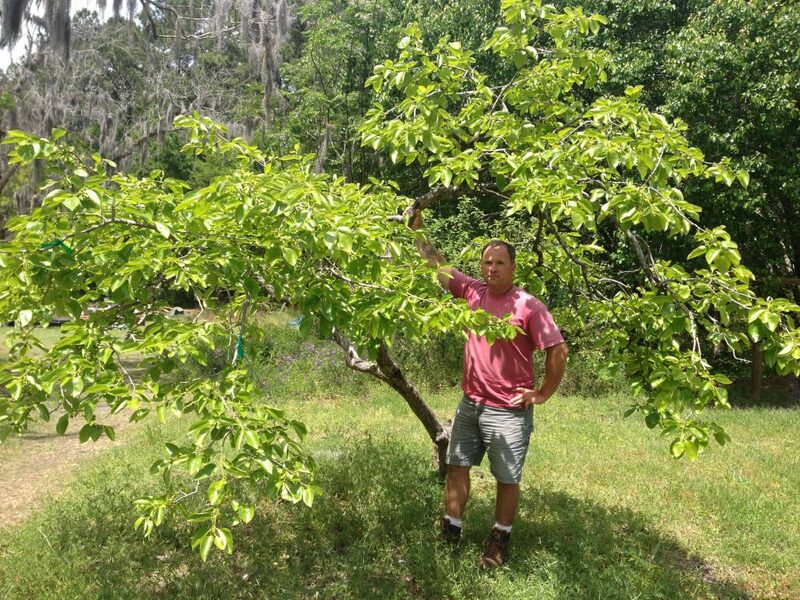 Blue Gold™ Revives Decades Old Persimmon Tree! At Eden Solutions, we treat you exactly the way we would like to be treated. Blue Gold™ was built by farmers for farmers. We are not in the business of managing problems. We alleviate them through Balanced Ratios of Deliverable Nutrition. Pest, disease, low yields, poor production, and problems are not a way of business! Refuse to be limited by traditional practices, Farm Maximal with Blue Gold™. We are Results Driven: experience Guaranteed Results on our Plant and Grand Champion PME® Animal Systems. We're a family owned business with old-fashioned customer service. Copyright © 2019 Eden Solutions, LLC. All Right Reserved. All Products Made in the USA.